Shakespeare's Globe Exhibition is the world's largest exhibition devoted to Shakespeare and the London in which he lived and worked. Housed beneath the reconstructed Globe Theatre on London's Bankside, the exhibition explores the remarkable story of the Globe, and brings Shakespeare's world to life using a range of interactive displays and live demonstrations. Upgrade to enjoy a delicious 'A Midsummer Night's Dream'–themed afternoon tea at the theater's restaurant after your tour. 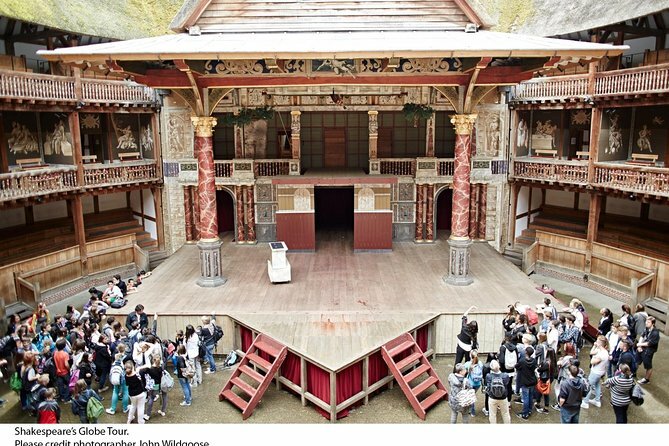 - During the peak theatre season (April 23 - October 2), there may be occasions when the Globe tours are unable to run due to matinee performances and rehearsals taking place. When the Globe tours are not available, Rose or Bankside tours can be offered instead. Visit the exciting and often dangerous world of Elizabethan London where in 1599, Bankside was the entertainment center of the capital packed with gambling dens, brothels, bear-baiting pits and theaters. Ordinary people flocked to see Shakespeare's plays and they laughed, cried, shouted abuse at the actors, ate and drank during the performances. As a visitor to the Exhibition you'll discover how shows were produced in the theaters of Shakespeare's time, from writing and rehearsals to music, dance and performance. Learn about the traditional crafts and techniques used during the process of rebuilding the Globe and find out how special effects were produced in Shakespeare's time — from thunder and lightning to flying on stage and realistic blood and gore. Listen to recordings from some of the most Shakespearean performances ever or join the cast and add your own voice to a scene recorded by Globe actors. Create your own Shakespearean phrases in the word jungle, watch a sword-fighting display and browse the costume collection, where you can find out about the extraordinary methods used in creating clothes 400 years ago. A visit to the Exhibition includes a guided tour of Shakespeare's Globe Theatre where storytellers take you on a fascinating half-hour tour of the auditorium. Journey through time to Elizabethan London with their colourful tales of the 1599 theater experience as well as the reconstruction process of the 1990s and how the wooden 'o' works today as an imaginative and experimental theatrical space. After visiting the Globe, you can upgrade to enjoy a quintessentially British afternoon tea — with a twist. Served at the Globe’s Swan restaurant, the tea is inspired by scenes from Shakespeare’s A Midsummer Night’s Dream. Sip prosecco and your choice of tea, and indulge in a delectable selection of finger sandwiches, scones and cakes — many of which can be traced back to characters and food featured in the play. See the Itinerary for a sample menu. Please note: If you’ve opted for the upgrade, please arrive by 11:45am (Monday to Saturday) or 10:45am (Sunday) to ensure you have enough time for the exhibition and tour before the afternoon tea. March to October – Monday 9.30am to 4.30pm, Tuesday to Saturday 9.30am to 12.00pm Sunday 9.30am to 11.00am Tour and Afternoon Tea Monday to Saturday Globe Theatre Tour is at 12.00pm and the Afternoon Tea is served at 13:00 Sunday Globe Theatre Tour is at 12.00 pm and the Afternoon Tea is served at 12:00. Important note: rehearsals will also take place throughout the Theatre Season. Please note that access to the Globe Theatre may be restricted.